Desert plants are resilient and their adaptations for surviving desert conditions are diverse and amazing. A key to plant survival is is the ability to reproduce. The reproduction of most annual and perennial species is dependant on the power attraction to the flower. The male parts of a flower are specialized to produce spores or pollen. Spores or pollen from the anther at the end of the stamen must find their way to the stigma. The female stigma is the surface on which spores or pollen must land (or be placed) during pollination. Here spores germinate and travel down the style of the pistil where fertilization takes place. Pollen transfers from stamen to stigma in three ways: self-pollination, animal pollination and wind pollination. The process of self-pollination occurs when the pollen from an anther fertilizes an egg on the same flower. Wind pollination is a primitive method and generally occurs among plants that live close together such as grasses and trees. Tremendous amounts of pollen are needed to ensure that at least some wind borne spores make it to the correct stigma. Spring flowers out on their annual show to attract animal pollinators from bees to hummingbirds. The colors and designs of flowers have developed over time to attract specific animals that fulfill their reproductive needs. Look into a Utah penstemon blossom and you will see patterns of color called "nectar guides." These guides are essentially runways with landing lights that lead the pollinator right to the nectar. Some flowers are generalists and do not care which animal pollinates them, while others have reliable partnerships. The yucca moth pollinates the yucca flower while she lays her eggs. In turn for her good deed, the yucca moth larva can feed on the developing seeds. This spring, take a closer look at the attractive power of The Mojave Desert's flowers. 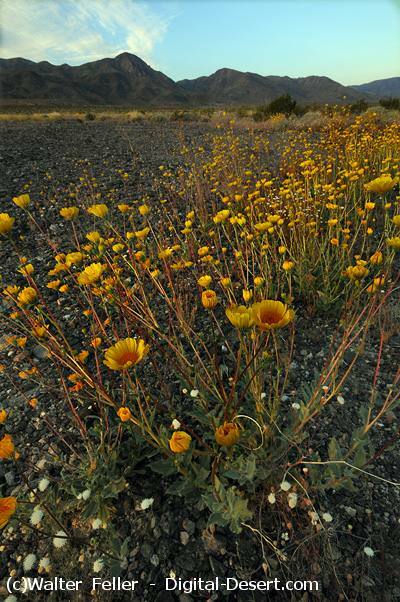 From April to June, you will see desert marigolds and globemallow everywhere. Firecracker penstemon, small leaf amosonia and scarlet guara may dress up the canyons. Springs and sandy creeks will show off dune primrose, chia, prickly pear cactus, larkspur and Fremont phacelia. Spring and early summer are the best times to experience the beauty of the Mojave Desert in bloom.